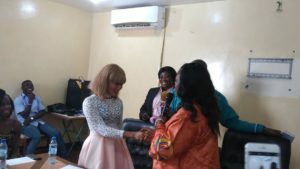 Africa Young Voices Television (AYV) and Ministry of Tourism and Cultural Affairs (MTCA) yesterday officially unveiled the winner of Big Sister Reality TV reality show. The unveiling took place during a press conference organised at the ministry’s conference room in Freetown. Addressing the press, Stella Bangura of AYV said the reality show was an avenue for young people to showcase their talents, adding that AYV and partners successfully put up the thirty (30) days programme, which ended last Sunday at Quincy’s night club. She disclosed that a float parade has been slated for this Saturday, from Calaba Town to Family Kingdom, designed to say thanks to fans and people of Sierra Leone. Madam Bangura disclosed that the public unveiling of the winner of the Big Sister Show would take place at the Family Kingdom resort this Sunday at 7p.m., adding that they would officially handover the car, cheque and gifts to the reality show winner. On his part, AYV CEO Anthony Navo Junior said they had planned over five years ago to unite Sierra Leoneans through entertainment after the 2018 elections, boasting that they have all the facilities to bring live event, as witnessed in the 2018 Big Sister show. “I want to thank AYV engineers who made it possible for us to showcase the programme to the entire world,” he said. The AYV CEO stated that during the show millions of people from all around the world voted. Navo thanked the government and people of Sierra Leone for creating the enabling environment for the successful outcome of the reality TV show. He promised that AYV and Zedzee would continue to collaborate in promoting the entertainment and tourism industry in the country. Zedzee representative and former Miss Sierra Leone, Aminata Bangura said the essence of Zedzee multimedia was to promote girls through the Big Sister Show, stating that Zainab Sheriff saw the need to enhance women’s empowerment, thus thanking AYV Media for giving them the platform. The former Miss Sierra Leone star thanked all partners, including Africell, for their contribution towards the successful outcome of the show. President of the Parliamentary Female Coucus, Hon. Veronica Sesay thanked the Minister of Tourism for her passion in developing the tourism industry. She congratulated the winner, Haja Mariama Kamara, popularly known as China Nicky, stating that life was not all about education. The longest serving female Member of Parliament further disclosed that she has been in the entertainment industry for a very long period of time, adding China Nicky would be invited to the House of Parliament. Minister of Tourism and Cultural Affairs, Mrs Memunatu Pratt said China Nicky represents a symbol of hope for thousands of women, especially those who feel left out in society. She thanked AYV and partners for enabling the show to be shown live all over the world. “As a government, we are very keen to supporting credible people and organisations who change lives,” she said. Mrs Pratt said there was need for a ministry like tourism to work with AYV for a partnership to transform tourism in the country, thus thanking them for the entertainment channel. She disclosed that they would be travelling with the Big Sister 2018 winner to the United Kingdom (UK) to represent the country in tourism business. The winner of the Big Sister Show thanked her fans at home and abroad for their immense and support for her during her stay in the Big Sister house. She showered praises on AYV media empire, Zedzee multimedia, Africell and other partners for creating the platform for her to showcase her talent. The Big Sister show was sponsored by AYV media Empire, Zedzee Multimedia, Africell, ITV and other partners.